There’s a show on Netflix that I adore called Galavant. It’s a musical and it always makes me laugh. The second season is far better than the first season, but both are pretty entertaining. (If you decide to watch it, give it like four or five episodes, the first few are a little rough.) 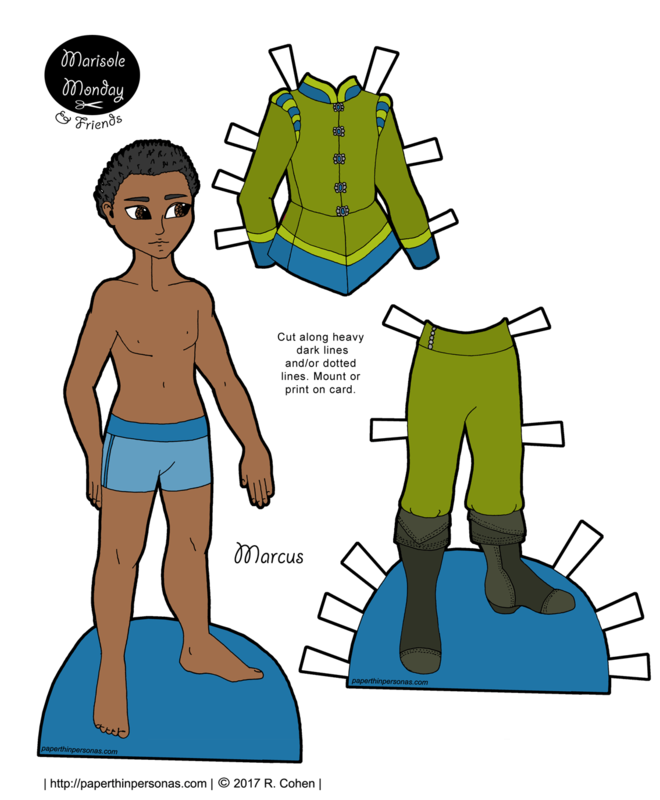 The very good looking Luke Youngblood plays Sid, the squire and inspired this paper doll’s hair. I admit it is not quite as awesome as Sid’s hair, but I did my best. Drawing male paper dolls will probably never be my favorite option, but I am trying very hard to create more gents in 2017 and the Sprites series has given me more practice in designing and drawing men’s clothing. I’m trying something different this week. I was going through my media library where all the paper doll content lives before I get it scheduled and ready to go out into the world and I realized that I have a lot more dolls then I have clothing sets ready to go. So, this week I am shaking up my “dolls on Monday” policy and posting nothing but dolls all week! You can look forward to a Mini-Maiden mermaid, a pair of Medieval fantasy Sprites and a B&B curvy space alien. Should be fun, I hope. That is so cool that you made a paper doll after Sid. He’s one of my favorite characters from the show. We watched a couple of episodes when it first came out but never got very far. Maybe we’ll go back and check it out after our Marvel Netflix obsession! Love this set. His hair is perfect and I love the Tudor inspired outfit. The buttons are beautiful!